This brand new and unique pattern will be the talk of your friends. It is made of Mandala yarn (in this case, Lion Brand) and is made using he the back loop only method to produce the striated surface. 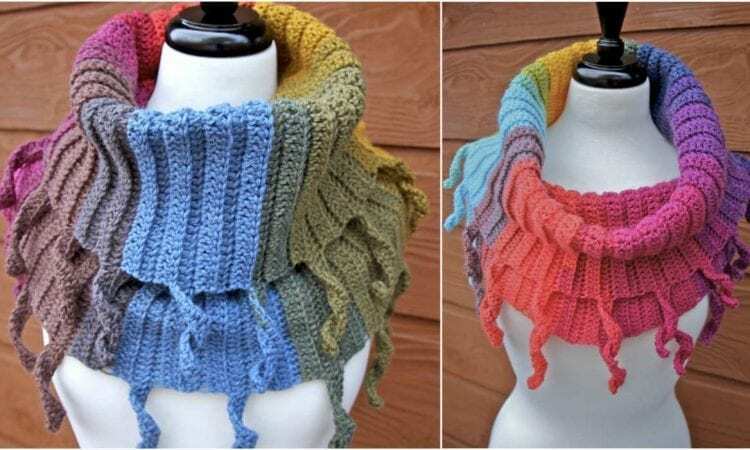 Coupled with the wild colors imparted by the yarn, the Curly Cute Cowl is an eye-catching garment that looks like a million dollars but is simple to make. For more free designs every day follow us on Facebook. Link to the free pattern is below. Curly Cute Cowl – Free Crochet Pattern is here. Don’t forget to Like us on Facebook. Share your ideas and your work on our Facebook group! Happy New Year! Crochet Scarf for Winters of 2016!